Update: This coupon is no longer available, however we have a new one for summer 2018. Click here to get it! There are some traffic sources you hear about all the time no matter what type of traffic you’re running (Facebook, Go2Mobi, PopAds, Taboola) and there are a lot of traffic sources that work but for obvious reasons (people making money in silence) you don’t hear much about them yet. If you’ve been into any of the latest Affiliate World or Affiliate Summit conferences you might have seen the guys from SelfAdvertiser/Revenuehits. I started working with them back in 2013 from the publisher’s side (Revenuehits) but when I started buying pop traffic I immediately thought of them. SelfAdvertiser has PPV and PPC traffic. PPV comes mostly in pops (setup a landing page and you’re good to go) while PPC traffic looks like banner ads from Adwords (you write a title, description and a URL). I mostly buy pop traffic from them as that’s were they have more volume. Back then they didn’t have a self-serve platform but they launched it in 2015 (if my memory works correctly) and the UI and platform works great. 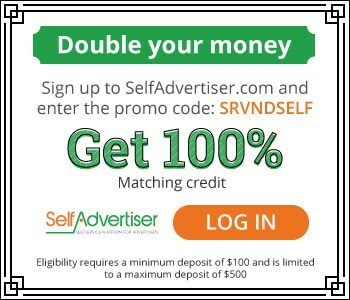 Today I want to show you how to setup a new campaign with SelfAdvertiser and if you’re new in this traffic network you’ll also receive a match up for your first deposit up to $500 USD (a.k.a. more money to test your campaigns). Hurry up because the promotion will be TIME LIMITED. The process to sign up with every network is as simple as filling a form and confirming your email. This time is no different, but if you want to grab that $500 match up you’ll need to sign up with my link. Sorry guys, there are no bonuses for old accounts. Sign up link: Click here. IMPORTANT: Just make sure you sign up through any of those links and my manager will be able to approve you faster and give you the bonus after you make your first deposit. First time after logging in you’ll see a dashboard like this but without graphs and campaigns of course. The first thing you’ll want to do is to go to your “Account Settings” and then to the “Billing Panel” to make your first deposit. SelfAdvertiser accepts Paypal and your first deposit needs to be $100 or more. After that you can deposit $10 as a minimum. To grab your match up bonus write SRVNDSELF in the promotion code field and deposit anything from $100 to $500 like in the image below. So no matter how much you deposit, you’ll get double up to $500 but no more. Now that you’ve got your account and funds the next step is to prepare your first campaign. Assuming you’ve got an offer to promote with a network you need to setup your tracker to track SelfAdvertiser’s tokens. @@SOURCE@@ – For the source (site) ID which presented your ad. @@CAMPAIGN-KEYWORD@@ – For the keyword matched by your campaign targeting. If you’re using other trackers just make sure your placeholder (e.g. @@SOURCE@@) is setup correctly and you’ll be good to go. Now it’s time to create your campaign in SelfAdvertiser. Login to your account and click the “New Campaign” green button in the main dashboard. Create a Group for your campaign (this is for organizational purposes) and give it a name. I selected the “Sweepstakes” group which I had created before while running this kind of offers. 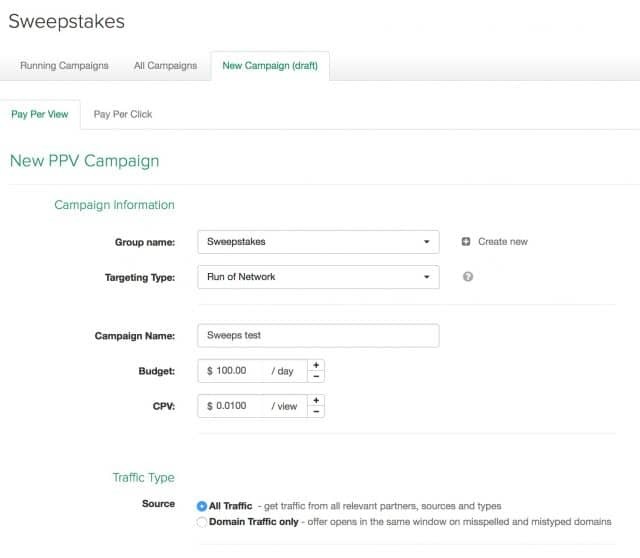 After that select if you want to target the campaign by Run Of Network (RON, a.k.a. receiving traffic from all websites) or keyword if you want to write down keywords to fire up your landing pages. The difference between SelfAdvertiser and many other pop networks is they allow you to fire your pops based on keywords in the domains or URLs. So if you are bidding for the keyword “buyiPhone.com” your ad will be shown in websites having the URL or domain name like “buyiphone.com“. The way their system fires up your links is by exact match keywords, so keep that in mind. You can do a similar targeting in networks like 50onred, Zeropark and LeadImpact but not in networks like Popcash or PopAds. 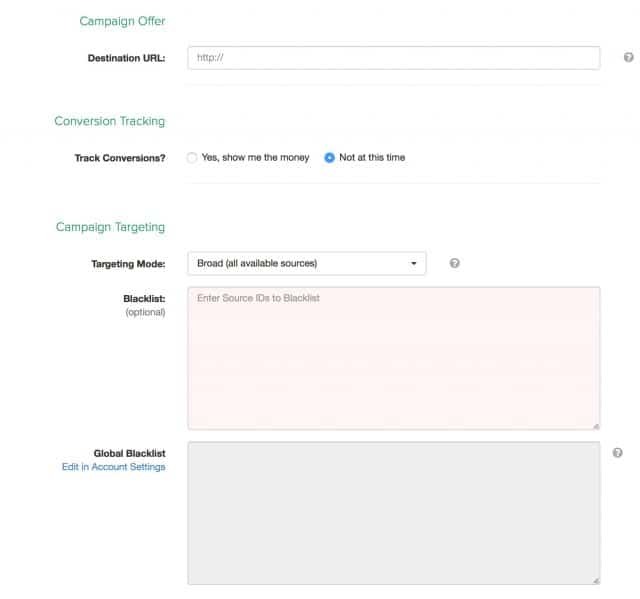 Here you’ll add the destination URL (campaign URL from Voluum, Adsbridge, Thrive, etc.) and leave the rest alone. After running your campaign and gathering data you’ll be able to come back here and decide if you want to whitelist or blacklist websites/keywords from your campaign but initially I just leave it empty. Here you can select the geo/country you’re going to run your campaign and all the advanced stuff like OS, browser, device, mobile carriers (for mobile campaigns) and more. In this example I selected tablet and Smartphone with Android and iOS to target mobile traffic. In case you want to select carriers the menu will change according to the country you’re targeting. I selected Canada in the screenshot above but your menu will be different if you select other geos. Setup your targeting based on the offer you’re going to run and start with an ad frequency of 1/day. 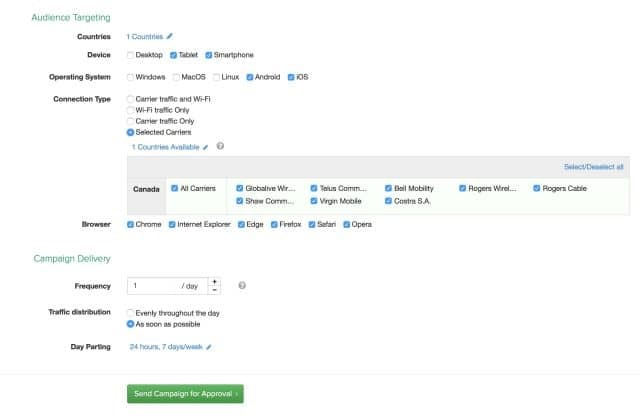 Select “As soon as possible” for your traffic distribution to gather data as fast as you can and send the campaign to approval. Once you launch your first campaign it will take around 12 hours to get approved. Sometimes it could be faster but it depends on your timezone. 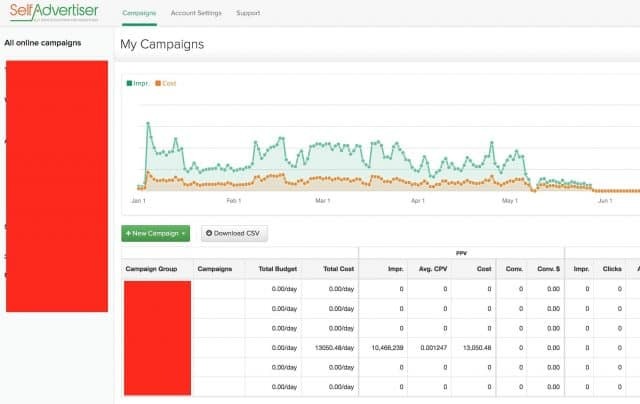 Wait to gather some data with your tracker and now you’ll be able to click your campaign from the SelfAdvertiser’s dashboard and see the websites that are sending you traffic and the graph showing the number of visits per day and costs. 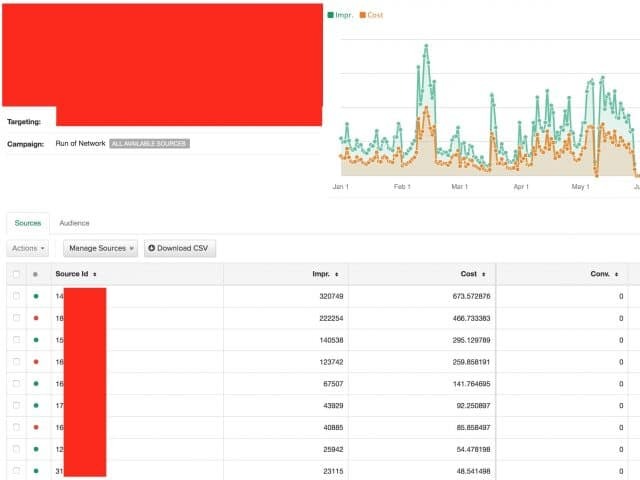 This was a small campaign I ran last year and the reason I show you this is because you can see I had several websites blocked (red dot) and several websites I was running at the moment (green dot). You can either blacklist the websites that are not performing well for your campaign in this menu by clicking the green dots or go back to your campaign menu and write them in the blacklist/whitelist fields. Both methods work fine. From my experience I have found SelfAdvertiser has some good quality traffic although you always have to blacklist a few websites with bots (pretty much every pop network suffers this). Some traffic while running keywords campaigns is definitely more expensive but worth it if you know how to target your audience. You can also create a global blacklist so every campaign you start has those websites blocked already but I don’t recommend doing it until you get enough data from several campaigns. Sometimes what works pretty well in one website for 1 country for Android traffic works a lot worse for another country and Mac traffic, just to mention an example. So blocking a website ID just because it doesn’t work in 1 geo could mean you’re going to lose profits in another geo/campaign. And of course, don’t forget to read your tracker’s data to optimize by OS, browser and devices which you can also enable/disable with SelfAdvertiser. SelfAdvertiser is a PPV traffic network with both mobile and desktop traffic. 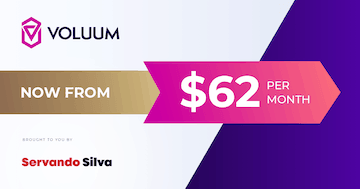 You can use their self-serve to launch and optimize campaigns (step by step explained above) and if you sign up through this link AND use the promo code SRVNDSELF while doing your first deposit you’ll receive a match up to $500 bucks. Does this coupon still work please? We’re about to launch a new coupon with SelfAdvertiser in 2 weeks or less. This code is not working , any new code available? Is that coupon SRVNDSELF still working ? Yes, the coupon still works. Thanks so much for content. i’ll back to paid traffic again after paused campaign 2 years. Back to school bro! Cool. What were you doing back then and what are you going to learn now? Hi Servando, thanks for sharing. Does it allow adult traffic? Do you mean if they have adult traffic? Not that I know. Or if you’re asking if they allow you to promote adult offers they don’t allow it either. I was wondering if serlfadvertiser deal is still valid? If yes, when do you expect it to expire? Just signed up. I look forward to using them. Hi Servando, is the coupon still available? Good to know! Now kill it with your campaigns! Hi Servando, is the coupon still working? 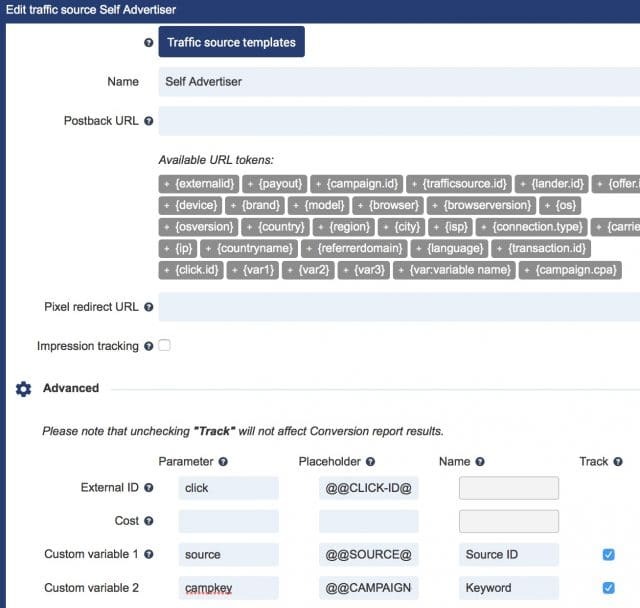 After reading this post i want to try selfadvertiser traffic . is this coupon code SRVNDSELF still available? Yes, the coupon is still available for now. 1) can you tell me what is MMO offer. can you give me a example? 2) what about the POP quality of SelfAdvertiser compared Zeropark. 3) The POP volume is smaller than zeropark? 1. MMO = Make money Online. So any offer like gambling, casino, binary, etc. 2. It depends on the country and targeting. Both of them will need to filter a list of websites after testing to make your campaigns work. 3. Zeropark is now one of the biggest RTBs for pop traffic, they definitely have more volume. To bad ZP is such a difficult company to be accepted by. I been using 50onred and SelfAdvertiser for the longest time but never got accepted by ZP I even use their sister company Voluum to track my campaigns. Is there a way you can help me get accepted with them? I would love to add them to my traffic sources. Alex, let me see if I can do something for you but it depends a lot on the interview they send you at the beginning. Also do you have any ebooks or did you write about how to find the best domains to target using PPV? I been struggling with finding the appropriate targets for some time now.Im sick of self targeting my campaigns because there’s always a certain limit that they will convert. No, I don’t have any books but when I run domain or keyword campaigns I just check the list with all the keywords and find offers that make sense to run there. Thanks for your detail answer. I have two question about zeropark. 1) I find many targets Available has many volume such as one target has 50,000, but i can’t buy the traffic i have set the bid BP is 1. how can i do to get traffic? 2) I run pop RON type do get traffic. and then i get some convert target. then I can deal with these convert target use two method. one is I add a new target pop campaign use these convert target only. the other is stay origin campaign. my question is the two method I get traffic volume from these convert target is the same or different? the two method bid BP is the same. because i find the zeropark algorithm is very complicated. Is RON type priority higher than target type? 1. Some targets need a higher BID if people are manually bidding. That or the target just blocked you from their site because they didn’t like your ads. 2. You’re talking about whitelisting and blacklisting. I prefer blacklisting but if the targets have enough volume then whitelisting works as well. In fact, many times I do both and even do manual bidding on different bids (high, average, low) for the white list campaigns. I am following you from Affiliate fix to this blog. Trying to read as much as possible on your articles as to expedite the learning curve which came across to this articles. The info provided really fire up my motivation to continue pursue what had initially ignited the passion to this industry. I am looking for PPV traffic sources to start promoting offers from two branded traffic sources and one of them just got approved last night. Would really appreciate if you able to clear my doubt below. 1. Is the Self advertiser (SA) promo code above still valid? another. MT, 50or or Self advertiser? Any other recommendation for newbie would be highly appreciated. 3. Adplexity is solid, bit they mostly cover pops, not keyword PPV. If you want PPV like the sources you mentioned BoxofAds is another choice but not as solid as Adplexity. 4. Also consider propel media and Zeropark if your budget allows it. 1. I have topped up the account using your link and got the bonus instantaneously. Thanks for effort for bringing the “bonus” to us, it is an motivation for newbies to test more. 2. I will stick with SA first, see what I can find with their traffic. 3. Since I am heading to PPV, maybe just leave Adplexity for later part. BoxofAds…….reserve my comment first as for now. 4. Will definitely give it a try after mastering necessary skills first, heard that the competition is intense there. 5. I have tried to launch campaign but failed. Tested the CPV lab campaign link but it returns “No campaign ID”. Guessed may be CPV lab traffic sources set up is wrong. Would really appreciate if you have help on this part if you can. 6. Do you mind to send me the excel list of keywords or url by countries for testing? Hi Alex. Good to know it worked effortlessly. Stick with 1 traffic source and make it work. How many campaigns have you tested? I don’t work with CPV Lab, but i recommend Voluum or Adsbridge. I’ve tried several times to reply here on 26Apr and now but failed. Hi Alex. I got this comment. I also see your comments on April 25 and 26. Is there anything else? One thing I can’t figure out is how to use their Domain Redirect traffic. Let’s say I am promoting a branded product like “norton” and I want to setup a campaign using the domain redirect instead of PPV. What keywords should I use to make my offer relevant enough to get traffic to?Example I should use “norton” or go mainstream like “antivirus”?Because mainstream keywords will trigger the redirect way to often right? Redirect works same as PPV with less volume available but higher quality. Yes, you should test different keywords or even go broad and test a RON campaign and start optimizing from them. What is the min bid for pop at selfadvertiser ? which is better propel media(traffic vance) or selfadvertiser ? The min bid is 0.001 per view, which is a $1 CPM. Propel has traffic form toolbars (known for very high quality) while Selfadvertiser has traffic from web pops, toolbars and even domain traffic, so depends on what works better for you. 1. do we need spy tools before we run campagins. how? 2. how do u creat landingpage. from conpetiters? i want to know more on this. because i have no clue. 3. it seems that selfadvertise is a better choice than 50 and LI. any suggestions? in my opionon 50 and Li are more professional and good for ppv traffic when we use target keywords and urls. 4. if we promote a sweepstakes offer using ron method. how much budget should be ok before we can know whether the campagins work or not. 1. You don’t need them, but it’s a very good competitive advantage, especially when you’re getting started. 2. Spy tools help you download some landers but you can alaways learn how to create them with Adobe Muse or raw HTML. There are a lot of tutorials about them if you search in Google. There are also landing page creators which could work for your traffic. 3. They’re similar, and the entry barrier is lower (first deposit and bids), but they’re very similar in terms of how traffic works. LI has more volume. 4. Depends on your offer payout. It’d recommend at least testing with 10x or more.So if your offer pays $1 USD, try spending at least $10-20 to get some decent data. If your offer pays $5, you’ll need at least $50 and so on. Hi. This network is good for movie related offers? Streaming offers tend to do well if they’re solid. Yes, they allow it but keep in mind it’s exact match, so it will just match the exact URL and not variants like “domain.com/category/page” unless you add them too. Like many others mentioned, it’d be nice to get the bonus if we already have an account though. Been using Selfadvertiser for quite a while now. I’ll see what we can do. Maybe a smaller promo but if you’re already buying traffic there I’m not sure they’ll accept. Sorry I did not explain properly. I meant you should make the terms of this offer the same as that of Zeropark: allow us to use the code even after, as long as we created an account. Thanks man, love what you are doing. I’ll consider it for future promos. Thanks! does the promo balance has an expiry date? I’ll consider a case study but it’s always a risk as it exposes my campaigns a bit. As for the promo code, it doesn’t expire so you can use it now, the next week or in 1 month. Wait, so does this mean if I already have a Selfadvertiser account I can’t use this promo? Let me see we can do about this. But yes it’s for new advertisers only. Do you have an account were you had already spent money there? Just spent like $50 to test them out but never continued my tests, shouldnt the coupon work regardless? If your account is not new and you had deposited before already the promo won’t work. Sorry. I want to get started in mobile very soon, I am saving up now. Can you please do what you did for zeropark and make the coupon available if you created an account before the deadline. You had that coupon before I found you. Yeah, I have done that coupon with them 2 times before, but i won’t have any coupon soon. Maybe in a few months. Meanwhile you could get started with SelfAdvertiser before this offer ends too. (newbie question) Is this TS good for mobile affiliate marketing? Thanks! If you want to get started with mobile pops, yes for sure. And the bonus will always help you get started and run more campaigns at the beginning. Awesome, thank you a lot! Does this TS work well with AV pins? It’s a pop/ppv traffic source. Most offers work there but you’ll have to follow the rules to get your creatives accepted.